Cromer Electrical is a trustworthy and reliable electrical contractor based in the North Norfolk seaside town after which it takes its name. Our skilled qualified electricians provide high-quality services for both commercial and domestic customers across North Norfolk. Thanks to years of experience in the electrical industry our team can complete major contracts, including a full rewiring service, as well as smaller tasks involving minor electrical installations. Our prices are always fair and competitive and we ensure completion of a project to an agreed deadline. Customer service is at the heart of our Cromer operation and we work hard to ensure customer satisfaction. We have found that our reward for that is regular repeat business. We are viewed as the North Norfolk Electricians of choice! As soon as you contact us by telephone or online we will deliver a first-class service. We have an emergency response service that operates 24/7, 365 days a year. We also offer free advice if you have a query about an electrical problem. Taking care of employee health and safety is an important workplace requirement and we believe it is just as important in your home. That’s why, whether contracted to undertake a domestic or a commercial electrical job, we comply with the latest regulations. In the UK this is the 17th Edition (incorporating Amendment 1) of the IET (formerly IEE) Wiring Regulations BS 7671 (2008), which was last amended in 2011. Our technicians are qualified to inspect, test and issue safety certificates for a wide range of electrical systems and appliances in the home or workplace. When using our service business customers can be sure they are complying with relevant health and safety regulations and homeowners benefit from the peace of mind that using highly qualified experts can bring. In all cases we offer a personal guarantee that the work we have undertaken is fit for purpose and completely safe. If you need an electrician immediately, get in touch with us on 01263 513681 and one of our experienced team will get to you as soon as possible. 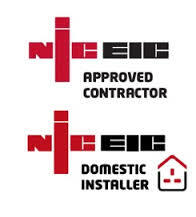 Cromer Electrical Ltd is a registered contractor approved by the National Inspection Council for Electrical Installation Contracting.